Amazon.com’s Prime keeps attracting more and more members, and new data from Wall Street firm Cowen & Co suggests the subscription service is getting stickier, posing a more intense threat to traditional retailers trying to claw back market share. The survey suggests Amazon Prime is drawing younger and wealthier shoppers who are now using the website to shop for an increasingly diverse range of products, notably apparel. According to Cowen’s survey of 2,500 customers, members of Prime -- a $99 annual subscription service that offers, among other benefits, free two-day shipping -- have an average household income is $69,300, well above the income of Amazon shoppers in general, and some 24.8 percent higher than Walmart shoppers’ average income and 4 percent above Target’s. 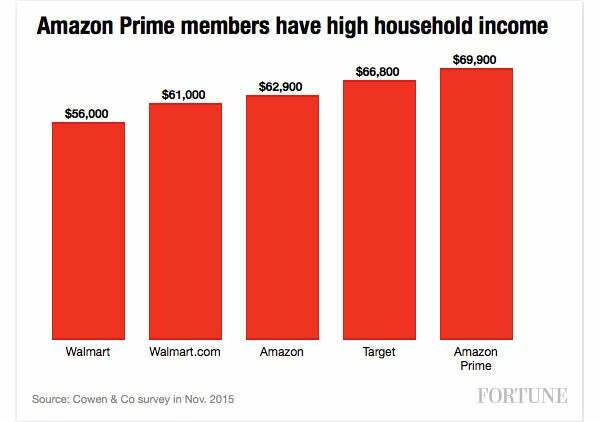 That means Prime is particularly enticing to the higher income shoppers both Walmart and Target are trying to woo. What’s more, the Prime customer is younger, averaging 36.5 years old, versus 42 at Walmart. (Target attracts a similarly younger clientele to Amazon Prime.) What more could a retailer want than younger, more affluent shoppers? Prime members are shopping across more categories than they were a year ago (4 compared to 3.6), suggesting Amazon is winning more and more of people’s total spending. Slice Intelligence data provided to Fortune this week estimated that 36.1 percent of all online spending on Cyber Monday, a $3 billion shopping event, happened at Amazon.com. 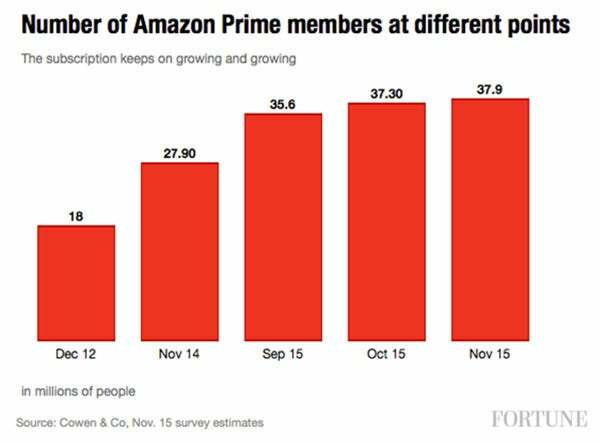 And there were also more of them: Cowen estimated there were 41 million Prime members last month, up 1 million from a month earlier, lured by the many benefits Amazon is pushing to get people to subscribe, including Prime Now one-hour delivery service and free same-day delivery in some key markets. In a frightening new development for other retailers, Amazon customers are buying more and more apparel: the number of Amazon customers saying they buy clothes there rose 35 percent in November compared to a year earlier. Cowen this summer forecast that Amazon would surpass Macy’s as the top U.S. retailer of apparel by 2017. As the graphic below suggests, adoption of Prime keeps on growing, meaning Amazon will keep getting harder and harder for Walmart, Target, and others to catch. Both Walmart and Target reported modest e-commerce growth rates last quarter, as the Amazon juggernaut gained steam.